Rapper Kanye West has confirmed reports he and Drake are working on a new album together. Back in August (16) a billboard featuring the logos of the two hip hop superstars' respective record labels, GOOD Music and OVO Sound, emerged in Los Angeles, leading fans to believe a potential collaboration was in the works, and, while promoting his Yeezy Season 4 fashion line during an interview with Vogue U.S., Kanye confirmed he and Drake are recording new music with each other. "We're just working on music, working on a bunch of music together, just having fun going into the studio," West revealed. "We're working on an album, so there's some exciting things coming up soon." 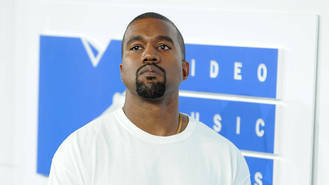 The Flashing Lights hitmaker did not disclose a potential album title or a release date for his collaborative effort with Drake, but he opened up about moving forward with other professional pursuits following the close of his Saint Pablo Tour, which ends on 1 November (16) in Inglewood, California. Kanye and his wife Kim Kardashian intend to begin working on a children's clothing line in addition to opening up stores around the world. "I believe the first one will be in California, since that's where I stay now," he said. "I can go there most often, check in, get the vibe. But I want to do 200 stores in the next year. That's just me saying what I want. I'm not saying what can definitely happen but you might as well just state out loud what you want. That'll put you one step closer to getting it." Zayn Malik baffled Bella Hadid when they first met, because she couldn't understand his accent. Kanye West has signed Tyga to his record label. Madonna and her ex-husband Guy Ritchie have officially settled their custody dispute over teenage son Rocco. Ariana Grande and Mac Miller have confirmed their relationship in a cute Instagram snap. Clean Bandit's Jack Patterson is paranoid about losing his laptop because it has so much music saved on it. Ice Cube won't shed any tears over the death of N.W.A. 's former manager Jerry Heller. Amy Schumer and Chris Pine landed the top prizes at the GQ Men Of The Year Awards in London on Tuesday (06Sep16). Former One Direction star Zayn Malik is officially onboard to executive produce a TV series about a fictional boy band. Stevie Nicks regrets ever doing drugs now that she knows she can play gigs sober.